– Breeding stock: Caudal scute cutting or tagging with a numbered, coloured plastic tag inserted through one of the large caudal scutes. 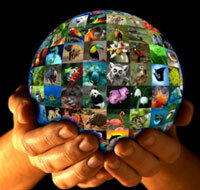 – Skins and live specimens: CITES tags compliant with Resolution Conf. 11.12 (Rev. CoP15). – Finished products (sold as personal effects, no more than 4 per person): certificates issued with the operation's CITES registration code, details of buyers and destination. – Bulk exports of finished products: total amount of raw materials used to manufacture the finished products converted into the number of crocodile skins, which is equivalent to the number of animals slaughtered or to that of CITES skin tags. Additionally, the CITES Management Authority of Viet Nam will issue an export permit that states the number of finished products and of crocodile skins together with the corresponding CITES tag numbers. – Meat: packed in containers marked or labelled to indicate the quantity and nature of contents, and the name or CITES code of the operation. This information will also be included in the export permits issued by the CITES Management Authority of Viet Nam. –Breeding stock: Caudal scute cutting or tagging with a numbered, coloured plastic tag inserted through one of the large caudal scutes. – Skins and live specimens: CITES tags compliant with Resolution Conf. 11.12 (Rev. CoP15) – Finished products (sold as personal effects, no more than 4 per person): certificates issued with the operation's CITES registration code, details of buyers and destination. – Bulk exports of finished products: total amount of raw materials used to manufacture the finished products converted into the number of crocodile skins, which is equivalent to the number of animals slaughtered or to that of CITES skin tags. Additionally, the CITES Management Authority of Viet Nam will issue an export permit that states the number of finished products and of crocodile skins together with the corresponding CITES tag numbers. – Meat: packed in containers marked or labelled to indicate the quantity and nature of contents, and the name or CITES code of the operation. This information will also be included in the export permits issued by the CITES Management Authority of Viet Nam.